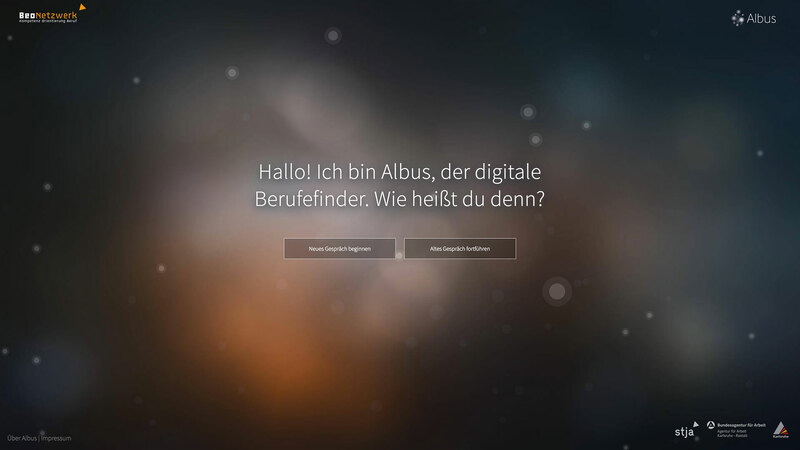 Albus is a digital, strength-oriented career finder. The Steinbeis Research Center Design and Systems Würzburg developed Albus in cooperation with the BeoNetwork – a facility for career orientation of the Municipal Youth Committee e.V. Karlsruhe. The online tool is currently used to strengthen the decision-making and action skills of young people. The development of the program focuses on a resource-oriented attitude and thus a strength-oriented communication style. Best practices of BeoNetwork interlock with an innovative technique that hides behind Albus (developed by Lukas Dürrbeck, M.A. Communication Design). In a chat with the job finder, teens can find out where their strengths lie and which professions could suit them. Afterwards, they will be offered concrete offers from BeoNetzwerk in Karlsruhe, where they can try out practically the recommended occupational fields. Albus is characterized by a low-threshold approach and a trusting character, which corresponds to the life of young people and is subject to a constant process, which adapts to current needs of the target group.